With the sun gently embracing us, my daughter and I head out for a minibeast adventure in the suburbs. We walk to our local park. There are no traditional plastic or metal playgrounds here; rather, it has natural vegetation, open grassy areas, large boulders to clamber on and lots of bugs. In search of 'the little things' we check we have our essentials, including: curiosity, imagination, a sense of adventure and excitement of what we might find. We also have more practical items such as a bug jar, sweep net, magnifying glass, notepad and pencil, small paint brush and a large white sheet. Firstly, we think about where to look. I encourage her to ‘look up, down and all around’, while also reminding her that ‘you are a giant to a teeny-tiny bug so tread carefully and observe what’s around you’. We look to the sky and scan a metre or so above the grass for flying insects. 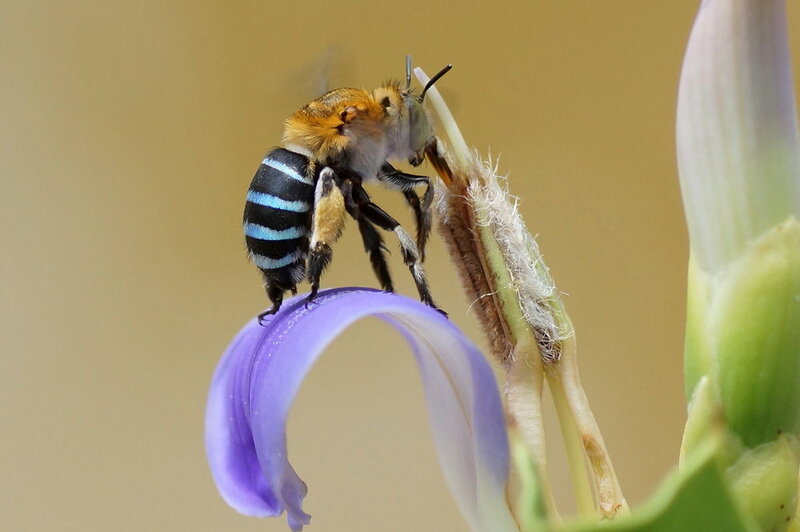 Depending on the time of year, we may see butterflies, bees, wasps and dragonflies. Out of the corner of my eye I see a dainty, fluttering flash of white, black and red. We run to try and catch a closer glimpse of the beautiful butterfly trying to evade us. It lands for what feels like a split second, then it's off again. ‘A Dingy Swallowtail,’ I say. These butterflies are active in spring and summer and are known to lay their eggs on citrus trees. They have a slightly awkward flight and you rarely see them land for long. They are beautiful creatures to observe as they flitter and flutter by. We then encounter a large old log. Together, we slowly roll it over to reveal a myriad of invertebrate life. 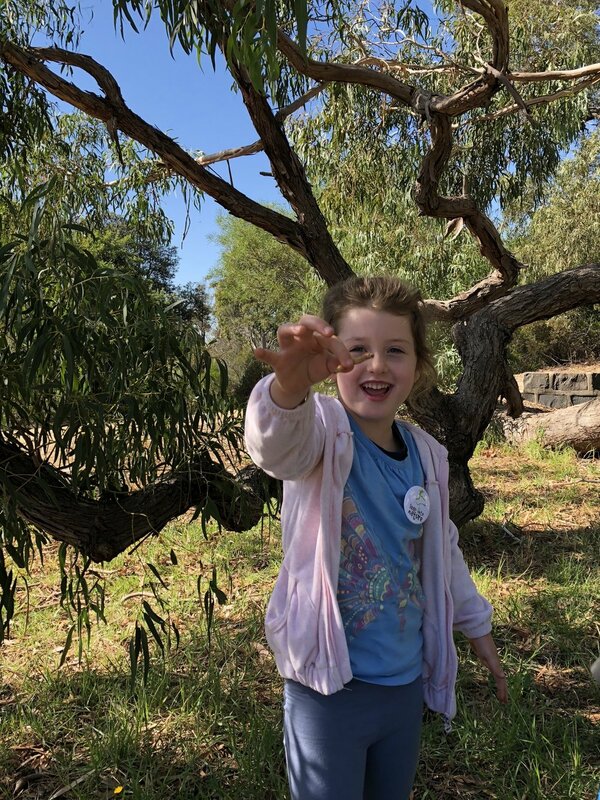 My daughter doesn’t hesitate, but reaches in to pick up a millipede and giggles as it tickles her hand with its many hair-like legs. We spot a small grey ball. ‘Roly poly!’, yells my daughter. Also referred to as slaters, butchy boys, pill bugs and woodlice, these isopods are a type of crustacean, related to their oceanic counterparts. Often you can find two types in suburban areas that are introduced from Europe: pillbugs, which curl up like an armadillo to protect themselves, and slaters, which have a flatter body and scurry away to protect themselves from light and heat. Slaters have small limbs underneath their body at the tail end that act as “lungs”, so they kind of breathe through their bums – a fact kids find rather funny. To end our bug hunt, we stroll over to a nice, dense wattle tree. We place our large white sheet under the branches and give them a shake. My daughter then grabs her magnifying glass, brush and bug jar. We find lots of ants and small flying insects that had been so well camouflaged on the tree, we would never have known they were there. You can often find stick insects, praying mantids and "true bugs" with this technique. One miniature specimen we find is the Fireblight Leaf-beetle. We use our small paint brush to gently sweep the beetle into our bug jar for closer inspection. 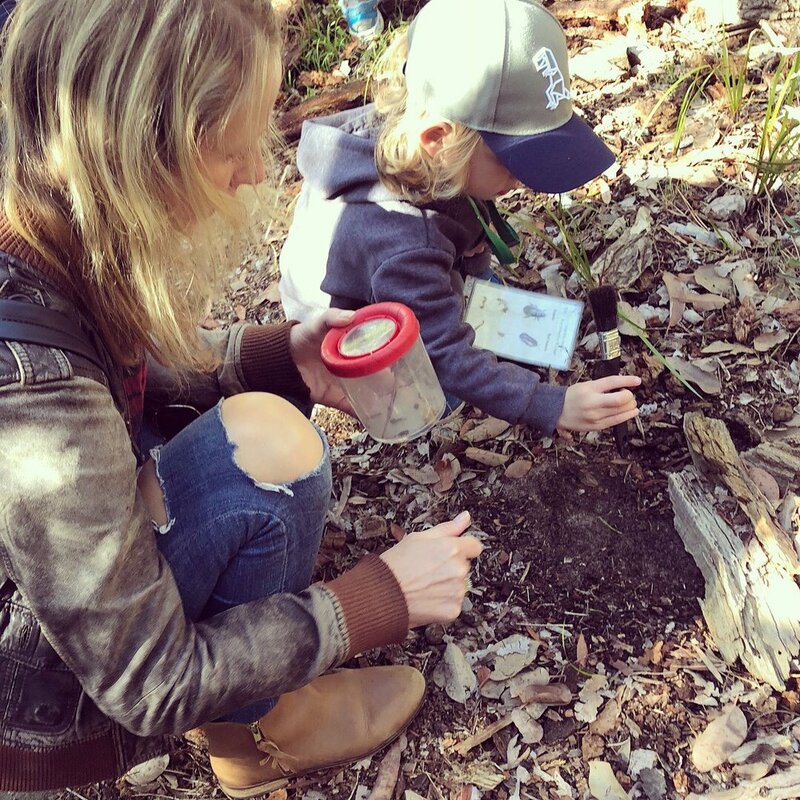 Bug hunting is a simple nature connection activity to do with children of any age, from toddlers to teenagers, and anywhere from backyards to national parks. It doesn’t matter so much about identifying what you find; it’s more about embracing the act of discovery with your children. With an adult present and offering guidance when needed, it reassures and encourages children to be confident in their observations and ability to make their own discoveries in nature. As adults we have probably seen hundreds of slaters, but for a child experiencing common critters for the first time, their face lights up and they are full of excitement and wonder. We need to embrace this, immerse ourselves in it, and nurture this excitement so that children will continue to find joy and wonder in nature for years to come. A great resource to accompany your bug hunting adventures is The Little Things that Run the City, available free to download here. Christina Renowden has had an affinity for nature since she was a child. Over the years this love of nature has morphed into one role or another, including studying conservation ecology, researching urban frogs, and working as a consultant zoologist. She is now a mother of two and the founder of Leap into Nature. Since 2014, Leap into Nature has been creating and presenting a range of nature-based and environmental education programs for young people. Christina is excited to begin a Master of Environment in July 2018 at the University of Melbourne and is currently the Vice President on the committee of management for Environment Education Victoria. Banner image of a Fruit-tree Root Weevil courtesy of John Tann from Sydney, Australia (Fruit-tree Root Weevil on wattle) [CC BY 2.0 (https://creativecommons.org/licenses/by/2.0)], via Wikimedia Commons.